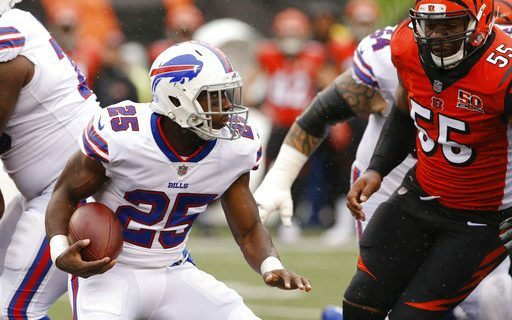 The Buffalo Bills got a dose of reality yesterday with their 20-16 loss to the Cincinnati Bengals in a game in which they were outplayed, but certainly could have won. To win on the road, regardless of the opponent, a team has to play a near-perfect game. That’s where the Bills came up short. Even though the game was a loss, it showed how far the Bills have come since last season. This is a team that right now has a chance in every game. As long as they play their game and keep mistakes to a minimum. The star of the game for the Bengals was All Pro wide receiver A.J. Green. As good as he played (7 receptions, 189 yards and a touchdown) he could have also been the goat. Green had a dropped pass that led to an interception, and also had a fumble after a big catch and run. Green torched rookie corner Tre’Davious White early on for a 77 yard touchdown. White being as inexperienced as he is will give up some big plays like that this year. But he has to learn from them, as he has the talent to become a solid shutdown corner in the league. One of the Bills problems in this game was they were unable to get enough points off of the turnovers they created. The Bills intercepted two passes and recovered a fumble but it led to only 10 Buffalo points. When a team creates that many turnovers in a game they have to be more opportunistic and score. 10 Points just isn’t enough. After two fairly strong games, Bills quarterback Tyrod Taylor had a very average outing. He completed 20 of 37 throws but for only 166 yards and a touchdown. 166 yards gained on 37 total throws just doesn’t cut it. His average per throw was only 4.5 yards. It needs to be up over seven yards a throw for the Bills to have a chance. The Cincinnati defense had a lot to do with Taylor’s short comings. In the past few games Taylor has been able to get outside the pocket and throw on the move or make plays with his feet. The Bengals did an excellent job with keeping Taylor in the pocket and make him beat them with his arm. That isn’t going to happen. All season the Bills have struggled to get the ball to their wide receivers and that again was the case yesterday. Taylor completed only three passes to his wide receivers and this was against a Cincinnati defense that was playing with backup corners most of the game because of injuries. Tight end Charles Clay being out a good portion of the game with a leg injury also didn’t help. Clay is one of Taylor’s go-to guys and without him, there was no big play receiver available. Rookie Zay Jones, while very talented, is not ready to produce. Like many rookie receivers who come from spread offenses, he is struggling to get open on a consistent basis. He needs to step up his game, especially with Jordan Matthews out. The Bills defense had flashes yesterday, especially with the forced turnovers. But they just didn’t play as consistently as we have seen early on this year. The Bills gave up 323 yards passing and only got one sack. Bengals quarterback Andy Dalton, who was playing hurt, came up with big plays just about every time the Bengals needed one. The consistent intensity we have seen this year just wasn’t there yesterday. The good news is that the Bills are still 3-2 with and tied for first In the AFC East. They have a tough home game in two weeks with the Tampa Bay Buccaneers coming to town after the bye. It’s a winnable game, but the Bills have to play just about a perfect game in order to win.